When he approached, he did not notice the tiny glimmer from the dagger residing at her side but he would soon become rather well-acquainted with its cold, sharp demeanor. In the confusion that would follow, the flowers would find their final resting place by her side, and she at theirs. And in that moment to come - surrounded by the crumbling, weathered walls and the uneasy warks of his Chocobo steed - Delita would find himself struggling to fathom what had befallen him: Betrayal. 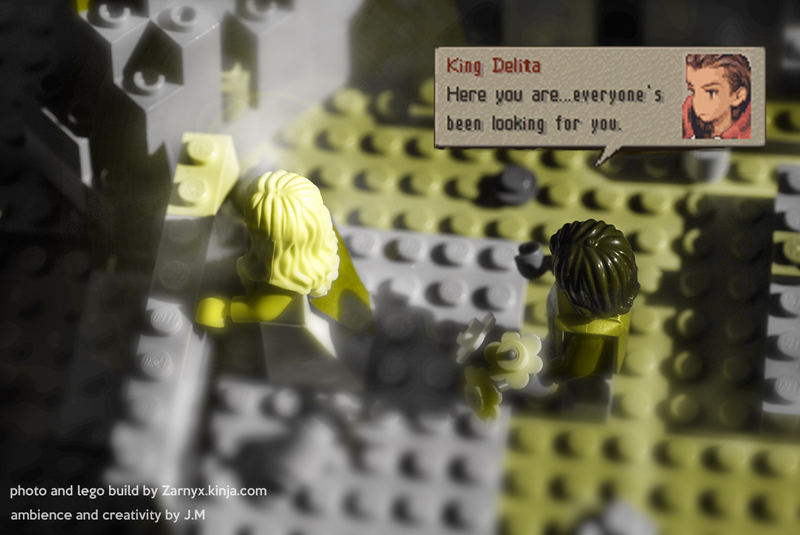 Lego Shot "Ovelia and Delita: The Moment Before Betrayal" was constructed using Lego, the sun, imagination and a heavy dash of Photoshop. Visit TAY Classic where the sprites will probably not try to stab you! Discussions on life, videogames and anything you want happen 24/7. Join in discussions or start one of your own! Just be sure to add the "Tay Classic" tag. If you had any questions on how TAY works, check out the tutorial.